This refried bean dip is packed full of creamy goodness. 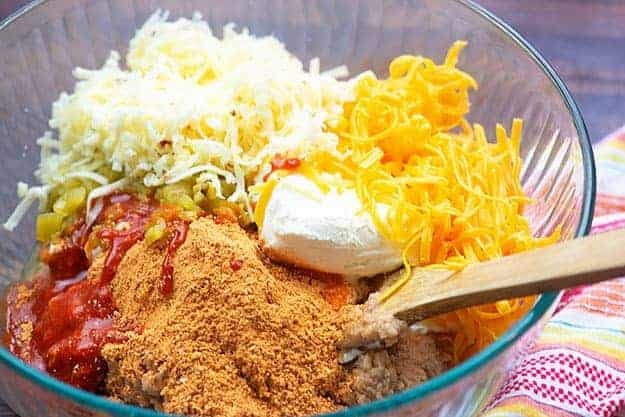 I start with refried beans, cream cheese, green chiles, taco seasoning, and loads of cheese for an ultra creamy bean dip that no one can stop eating! The best holiday of the year is coming up and I could not be more excited. I don’t care that it’s just an American excuse to eat fried tacos and restaurant style salsa. I will happily take any excuse I can get to celebrate my favorite cuisine! 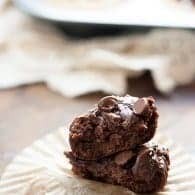 Lately, I’ve been obsessed with bean dip and I wanted to share my recipe with you. I started out with a recipe I found on Allrecipes, but I’ve tweaked it a bit into this version and it’s SO. DANG. GOOD. 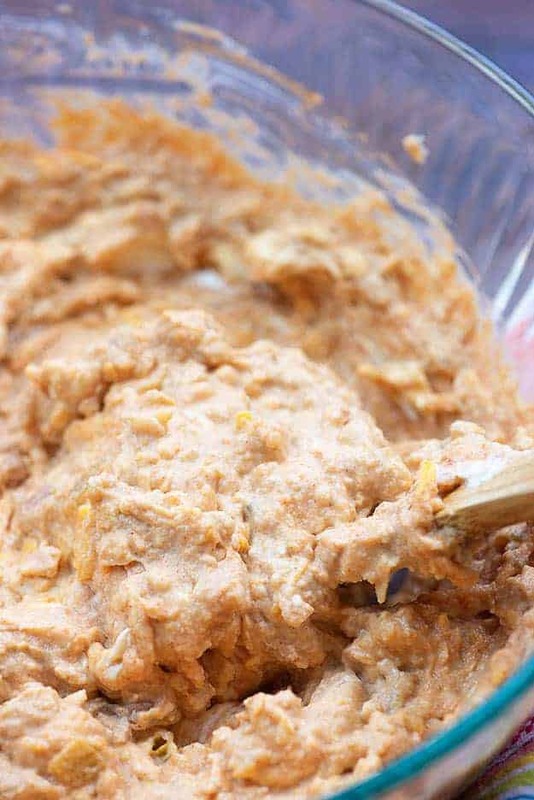 You really shouldn’t live another minute without this refried bean dip recipe in your life. I love to start off my homemade bean dip with my favorite homemade refried beans. 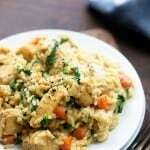 It’s a really easy and economical recipe that I think you’ll love. If you’re short on time or just not interested in making your own refried beans, go ahead and start with a couple cans of refried beans. No shame, friends. We’re making this bean dip with cream cheese, because that makes it extra creamy and delicious. Cream cheese really does make everything taste better, if you ask me! Add the cream cheese, sour cream, taco seasoning, cheddar, pepperjack, Cholula, and chopped green chiles to the beans and stir it all up really well. Spread that mixture into an 8×8 baking dish and top with more cheese. Bake this up for about 20 minutes to get it all hot and melty and then sprinkle with a little cilantro. 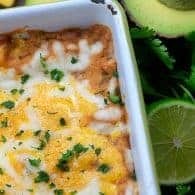 This bean dip recipe is perfect for dipping, but you can also add leftovers to burritos, quesadillas, enchiladas, or tostadas. It’s seriously so good no matter how you eat it! Taco Lasagna: This one went viral on Facebook! Low Carb Taco Soup: This chicken taco soup is a favorite around here! 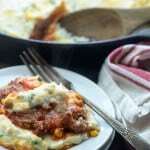 Mexican Cornbread Casserole: Cornbread and tacos belong together! 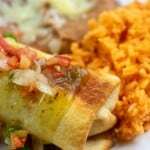 Crockpot Chicken Fajitas: So easy to toss in the slow cooker! 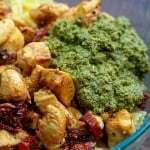 Mexican Chicken Casserole: We love casseroles! 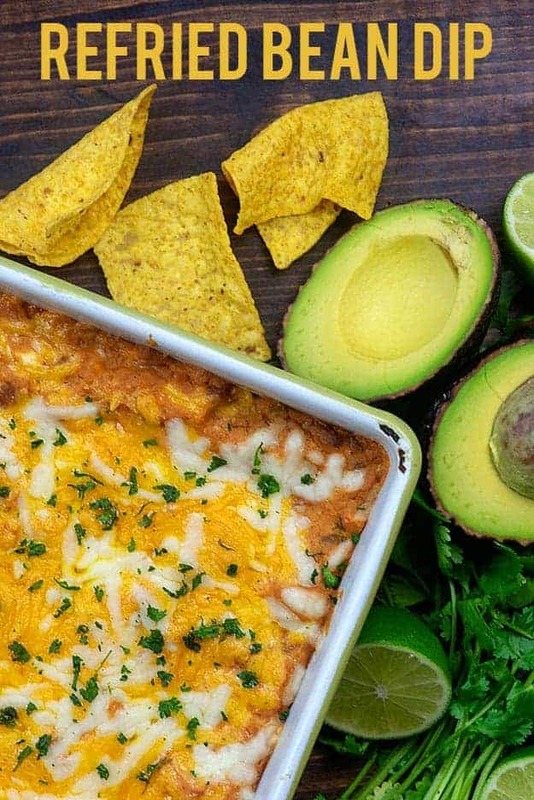 This bean dip is loaded with flavor and perfect for Taco Tuesday or Cinco de Mayo! Add all of the ingredients to a large mixing bowl, reserving half of the cheddar and pepper jack. Spread into an 8x8 baking dish and top with reserved cheese. 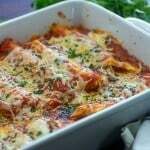 Bake for 20 minutes or until hot and cheese has melted. You may use any hot sauce you prefer, but Cholula is our go-to for anything Mexican! 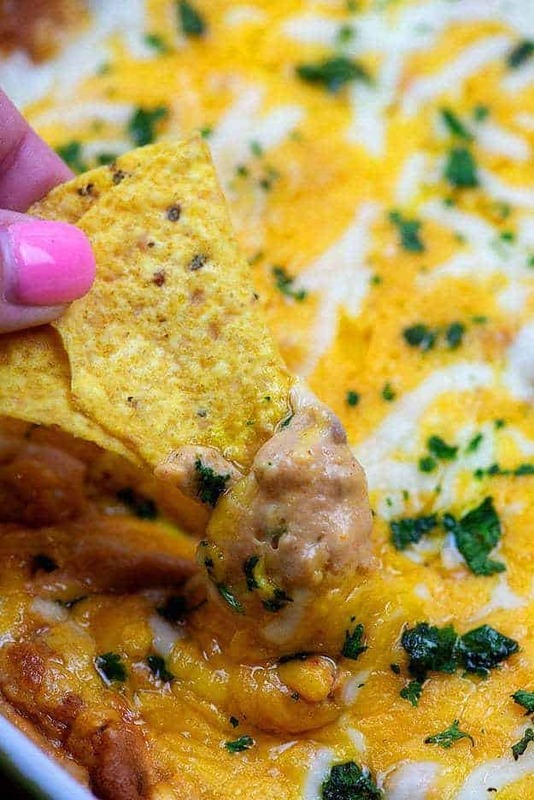 OOh yes this dip looks awesome. Perfect app for a party! 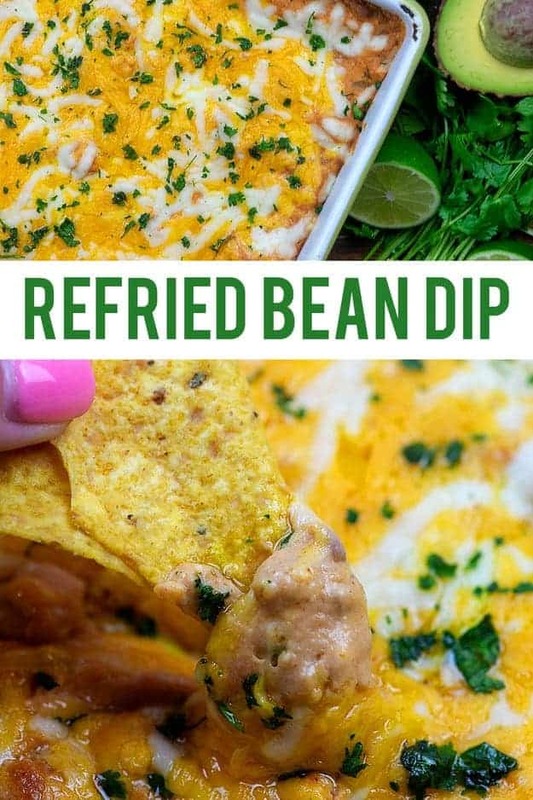 Not really big on bean dip but I will give this a try as soon as I make my next recipe of your refried beans. I love refried beans and this looks so good. Pinned! Karly, this dip looks fabulous! All my favorite flavors in there! Karly, this dip looks fabulous ! Pass me the chips and a margarita!! I’m all about a great dip for a chip! 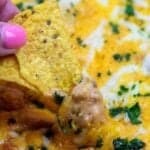 This bean dip looks like all the things I love! 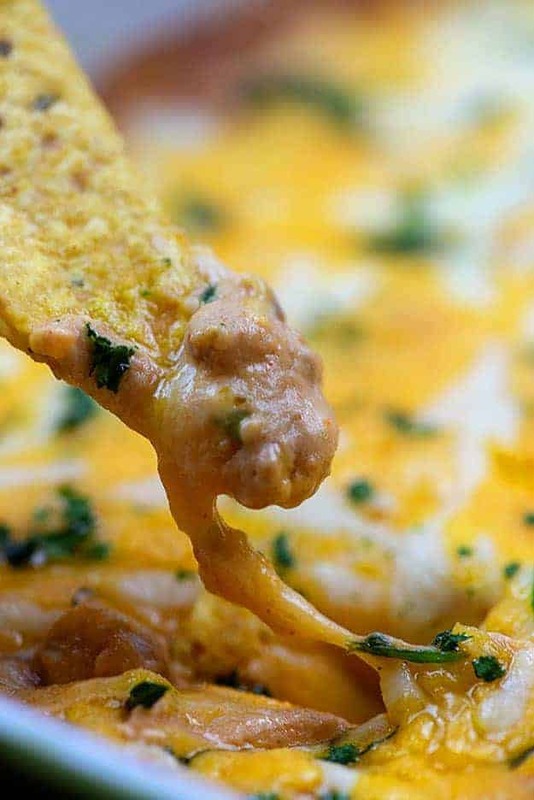 This dip will be making an appearance in my house soon! How can you give a rating to a recipe that you haven’t tried yet. Or how can you give a honest rating to a recipe that you tweaked. You are only giving yourself a rating. Make the original version, rate it and then say how you would change it up. THANKS. I’m not sure what you mean. 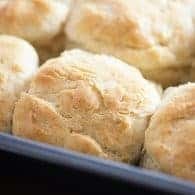 I did make this recipe. I photographed it and made a video of it as well. Karly, this comment was not meant for you. It was meant for other people who gave you a rating by just looking at the picture without trying the recipe first. 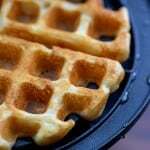 Others have even given your recipe a rating based on their tweaks without trying the original recipe as written. Sorry for any misunderstanding. 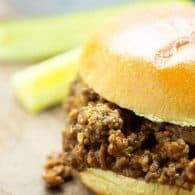 Love your recipes and your comments. I agree, Teresa. 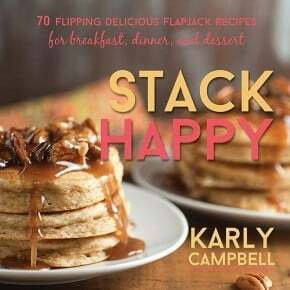 If Karly wants ratings, rate the recipe after you make it. We all think it looks great, but make it and report how it is.